Many vaporizer enthusiasts have haughtily debated this question. 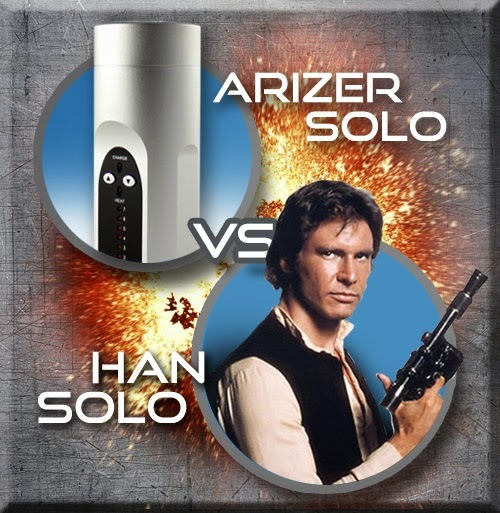 Who would win in a fight, Arizer Solo or Han Solo? Today we answer this question once and for all. Let's begin with their past history. Han Solo started out as a smuggler, making his name on the manufacturing planet named Corellia. He was orphaned early in his life only to be taken captive later by the Pirate Garris Shrike and made to serve on his dubious crew. This provided Han Solo with all he would need to eventually captain what is widely considered to be the fastest ship in the galaxy, the Millennium Falcon. His hard fought life and well deserved fame bodes well for him in this battle of the titans. His largest advantage however remains his undeniable charm and good looks. The Arizer Solo on the other hand is a much different story. Born of an aluminum outer shell to protect it's immense heating element from shock or in this case the DL-44 blaster pistol wielded by Han Solo, Arizer Solo is capable of resisting significant damage. The Arizer Solo much like the Millennium Falcon has also been described as the fastest vaporizer in the galaxy. With the capacity to vaporize all of your herbs at light speed. Arizer has been outperforming competitors for years and has a history of winning so ego could be an issue. Most analysts also believe that the Arizer Solo's compact size and extreme portability would prove difficult for Han Solo to deal with having been accustomed to fighting larger opponents. Being discreet and quick on the move has always been one of Arizer Solo biggest strengths and will continue to be one here. Arizer Solo was born in Canada located in the Milky Way galaxy, Han Solo on the other hand was born on Corellia in the year 29 BBY. Right off the bat we can see that Han Solo has a significant size advantage. Vegas would tell you that the sheer power and weight of Han Solo would be overwhelming for the smaller and lighter fighter Arizer Solo. But what the experts failed to take into consideration is the incredible charge Arizer is capable of holding. In some circles it has been said that Han Solo would probably gas out after just one session. In contrast it has been proven that Arizer Solo is capable of vaping for hours on end and going the distance in multiple vape sessions. If the Arizer Solo was able to make it past the first round, my bet would lean heavily in Arizer's favor. Many experts still remain divided on this issue but we have ran the stats, looked at all possible data and come to a decision. Arizer Solo wins 62% of the time after simulating 1,000 different matches. With the majority of Han Solo's wins coming by way of Chewbacca stepping on Arizer Solo in between rounds we estimate in a fair fight that Arizer Solo would be closer to a 7 to 1 favorite.